Hello again well I am so sad for today, but happy I actually got this amazing time to be here crafting with all these lovely ladies from the Jaded Blossom design team. and a very Big Thanks to Michelle and Candace for having me. 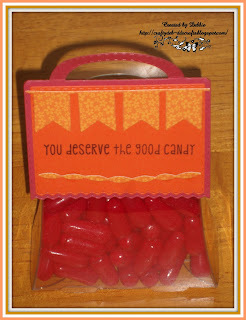 For this treat I used one of these cute purses from Jaded Blossom and I filled it with some Red Hots candies. I totally forgot I even had these purses, I think they are the cutest, they work perfect for a birthday party favor treat, or any kind of party favor. I just love Jaded Blossom store for all my party favors, stamps, and dies, as everything works so well together. "you deserve the good candy"
Well I hope you have enjoyed all this as much as I have, I've had so much fun you can't imagine. I just loved being here crafting for all of you, thanks again and please keep coming back for a visit.